Spring break is over, and we’re officially in the final countdown until summer. Of course, the last few weeks of the school year can also be some of the most stressful and jam-packed. Between final exams, term papers, big projects, and various extracurricular wrap-ups, you probably don’t have a ton of extra time to read… but trust us, this is one book you want to make time for. 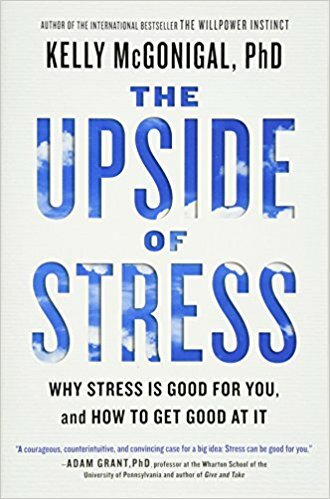 Psychologist Kelly McGonigal’s book The Upside of Stress: Why Stress is Good for You, and How to Get Good At It will not only teach you how to manage stress, but how to use it to your advantage. What do you think when you hear the word “stress”? For most of us, there are a handful of words and images that come to mind – and typically none of them are pleasant. Look “stress” up in the dictionary, however, and you’ll read, “a specific response by the body to a stimulus that disturbs or interferes with the normal physiological equilibrium of an organism.” So stress revs your body up and can make things feel out of whack… but is that always a bad thing? Kelly McGonigal argues no, it’s not always a bad thing. In The Upside of Stress, she says that stress actually offers a whole host of benefits! Stress “focuses your attention, heightens your senses, increases motivation, and mobilizes energy.” You’re ready for action, and you have the eye of the tiger. Additionally, stress “activates prosocial instincts, encourages social connection, enhances social cognition, dampens fear and increases courage” and “makes you want to be near friends or family.” Have you ever noticed that bond that forms between you and others when you’re in the same intense situation? That’s a good thing! Teamwork makes the dream work, after all. The most important thing that McGonigal argues in her book is that changing the way we view our stressors can change the way we experience them. “It turns out that how you think about stress is also one of those core beliefs that can affect your health, happiness, and success. As we’ll see, your stress mindset shapes everything from the emotions you feel during a stressful situation to the way you cope with stressful events. That, in turn, can determine whether you thrive under stress or end up burned out and depressed. The good news is, even if you are firmly convinced that stress is harmful, you can still cultivate a mindset that helps you thrive,” McGonigal writes.